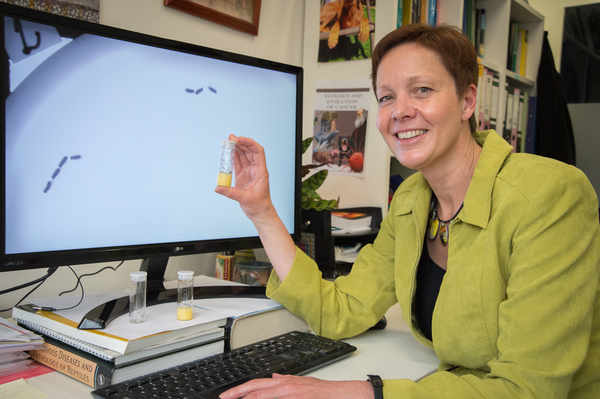 BREAKTHROUGH: Beata Ujvari with a sample of fruit flies in her Waterfront campus office. Loneliness might make the heart grow fonder but “world-first” Geelong research indicates it could also speed up the growth of cancer. The research could provide valuable insights for the treatment of humans after studying how social interaction affects stomach cancers in fruit flies. Deakin University’s Dr Beata Ujvari co-authored a paper on the study with collaborators in France and Spain. The senior lecturer in Bioinformatics and Genetics at Deakin’s waterfront School of Life and Environmental Sciences believed the findings could be applicable to human cancers. She hoped the work would help encourage a holistic approach to cancer research and treatment. Dr Ujvari and her European colleagues used fruit flies to track how cancerous tumours grew if the insect was in isolation compared with being kept in a group. The results, published this week in Nature Communications journal, showed that tumour progression advanced quickly when the fly was alone. Fruit flies were chosen for the experiment because they were “social animals, like humans”, Dr Ujvari said. She believed that the stress of isolation contributed to the faster tumour progression. “When we put the sick fly in with a group of healthy flies they socially isolated that fly to the point where it was experiencing similar levels of isolation to when it was being kept by itself, and we saw similar tumour progression to that scenario,” Dr Ujvari said. Dr Ujvari said was unsure why the healthy flies isolated others with a tumour but the healthy insects recognised that the cancerous fly behaved differently and was sick. The group’s results built on similar findings in rats, she said. “There have also been some studies in humans looking at the effects of socialisation on tumour growth, but more research is needed. Dr Ujvari said further similar evidence could make social supports an important focus for cancer treatment, on top of medical treatments like chemotherapy and radiation. “This research highlights the value of a holistic approach to cancer research and treatment,” she said.